. :: Education Guarantee Scheme /Alternative and Innovative Education / Special Training ::. Even after opening new schools in unserved habitations by way of formal schools, many children who are dropouts, never enrolled, working children, children living in isolated villages and hamlets and girls needing flexibility in school timings to adjust to domestic demands of sibling care and household chores, need to be provided access to some form of schooling facilities. For such children, alternative and innovative education facilities have been provided in the project districts. Moving away from a rigid centre- based approach, alternative schooling facilities that are more contextual, location specific and flexible have been evolved. AIE STRATEGY: The strategy for AIE is to provide alternative learning facilities to children with express purpose of mainstreaming as many children as possible into formal system. The implementation of strategy is done with active involvement of the Village Education Committee (VEC) / Ward Education Committee and the community. The VEC / WEC & the community have freedom to determine time duration, venue and holiday pattern for the AIE centre as per learner convenience aiming at transacting on an average four hours of learning. 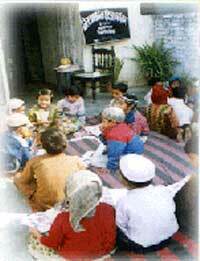 The AIE centres are completely managed by the Village Education Committee / Ward Education Committee. Priority is given to small and remote habitations and urban areas with atleast 20 children , Education of class 1 to 5 is imparted in theses centres. Bridge Course is a strategy to mainstream children of older age especially never enrolled and dropouts back to formal schools through a six month course, which helps to wean children away from work and enables the family to rellocate work done by children amongst the adults.The duration of course is six month . At end of camp the children are assessed and admitted to formal school in the appropriate class. There are two types of bridge courses in SSA, one is residential bridge course another is non residential bridge course. NGOs are being involved to run resedential and non - residential bridge courses. In those habitations where there is no school within one km. radius and there are minimum 30 learners for class I & II, the EGS centre were organised in the year of 2001-02 to 2009-10. Now all centres either have been upgraded in primary school or closed. Acharyaji/Instructor are selected by VEC who is local candidate. Honorarium Rs. 1000/- p.m. is given through VEC to Acharyaji Minimum qualification of Acharyaji is High School. He/she is selected on the basis of merit. Formal school textbooks are used in these centres. The Instructors of the centre are selected by VEC. The minimum educational qualification of an instructor is High School pass with merit. The instructors are paid honorarium of Rs. 2000/- by the VEC. The instructor - pupil ratio is 1:45, if there are more than 45 students in EGS / AIE centre provision of appointing 2 instructors for that AS centre exists. (one of these two instructors being lady). o The school Management Committee/local authority shall identify the children requiring Special Training Such children will be enroled, in the age specific class in the school . o After admission, the child shall be given Special Training by the teacher to enable him/her to successfully integrate with the rest of the class, academically and emotionally. o The Special Training shall be based on especially designed, age appropriate learning material, approved by the academic authority. o It shall be provided in classes held in the premises of the school, or in safe residential Schools. 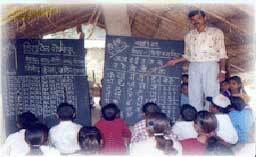 o specially engaged teacher should provide special training. Subject wise condensed textbooks for Class 1-5 have been devleoped by SCERT, 6 text books of Hindi ,English , Maths , Science have been distributed to all special training centres. Life skill development programme in 22 minority districts under innovative scheme. has been innetiated in 2008 .The districts are as below (1) Badaun (2) Bagpat (3) Bahraich (4) Balrampur (5) Barabanki (6) Bareli (7) Bijnor (8) Bulandshaher (9) Gaziabad (10) J.P.Nagar (11) Lakhimpur (12) Lucknow (13) Meerut (14) Moradabad (15) Muzzaffernagar (16) Pilibhit (17) Rampur (18) Saharanpur (19) Santkabirnagar (20) Shajahanpur (21) Siddhartnagar (22) Srawasti. o In all 22 districts 10-10 upper primary schools have been selected, the criteria of selection was where the minority enrollment should be more and there should be adequate infrastructural facility in the selected school. o School has given freedom to choose any to trades on the basis of the local need, requirement, the interest of student, availability of space in the school, available resources (physical and human) but the selected trade must be approved by respective DMs. o Training of selected trade has been organised in the school premises only. o The implementation agencies were also identified: (1) Government Polytechnic (2) Govt ITIs (3) Nehru Yuva Kendras (4) Jan Shikshan Sansthans (5).Gram Shiksha Samiti (VEC). o It is instructed to the districts authorities if the mentioned identified agencies are not interested or does not exist or have no resources to run the programme then agencies like Khadi Gramodhyog, Fruit preservation Deptt other Govt. Deptt which were also authorised to run this programme can be selected after the approval of the respective DM. o A Committee of 7 member has been constituted headed by district magistrate for the monitoring & supervision of the programme. The NPRCs have been given responsibility of supervising the EGS / AIE Centres running in their Nyaya Panchayats. They have been oriented for supervision.